The brown-capped pygmy woodpecker (Picoides nanus) aka Indian pygmy woodpecker belongs to the family Picidae. The brown-capped pygmy woodpecker species is distributed in India, Nepal and Sri Lanka. 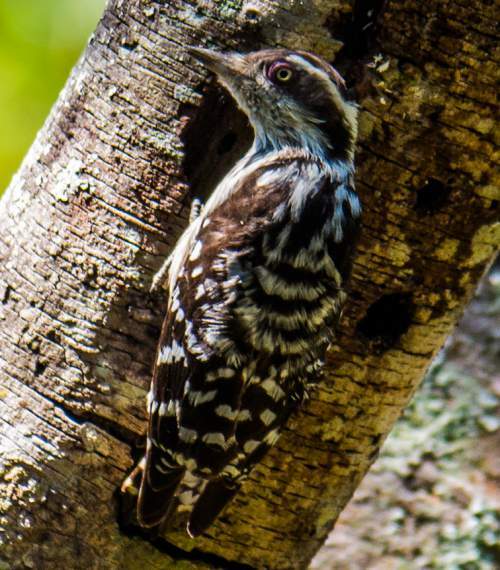 This pygmy woodpecker species has a distinctive white iris and a pink eye-ring. These pygmy woodpeckers are polytypic species. The brown-capped pygmy woodpecker (Picoides nanus) is a small bird, measuring 12 to 13 cm in length and weighing 12 to 18 grams. The brown-capped pygmy woodpecker has brownish cap from the forehead to hindneck. The male has a small red patch at the side of hind-crown. The ear coverts are dark and brownish. There is a white supercilium broadening towards the nape. The upperparts are chocolate colored with white barring. The brownish tail has white spots. The underparts are dirty white with light brownish streaking. The bill of the brown-capped pygmy woodpecker is dark gray. The irises are white and the eye-ring is pale pink. The feet are dark gray. Their call is a weak trilled rattling sound. The brown-capped pygmy woodpecker species are distributed in India, Nepal and Sri Lanka. In India, these pygmy woodpecker species are distributed in the states of Himachal Pradesh, Uttarakhand, Punjab, Haryana, Uttar Pradesh, Bihar, Sikkim, West Bengal, Odisha, Jharkhand, Chhattisgarh, Madhya Pradesh, Rajasthan, Gujarat, Maharashtra, Telangana, Andhra Pradesh, Karnataka, Goa, Tamil Nadu and Kerala. The brown-capped pygmy woodpecker nominate subspecies P. n. nanus is distributed in India (except southwest peninsular India) and south Nepal. 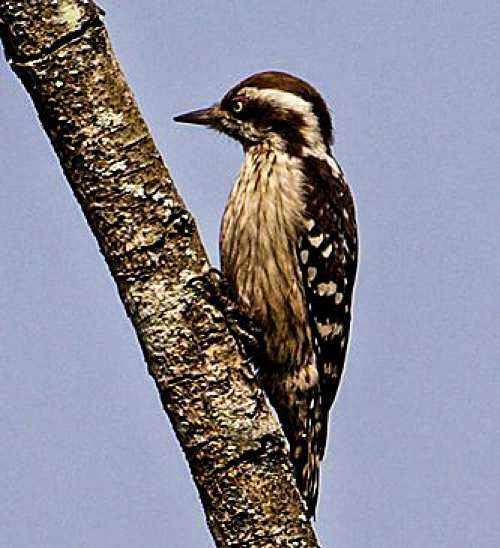 The pygmy woodpecker subspecies P. n. cinereigula is distributed in Kerala and western Tamil Nadu. The subspecies P. n. gymnopthalmos is distributed in Sri Lanka. These brown-capped pygmy woodpecker species have moderate forest dependence. They normally occur in altitudes from 0 to 1200 meters. The artificial ecosystems and habitats of these pygmy woodpeckers include rural gardens, trees near cultivated lands, urban parks and plantations. The natural ecosystems and habitats of these brown-capped pygmy woodpeckers include tropical and subtropical dry forests, secondary forests, tropical and subtropical moist lowland forests, deciduous forests and mangrove forests. The diet of brown-capped pygmy woodpecker consists mainly of small invertebrates. Insects, insect larvae, ants, termites, beetles, spiders, cicadas and crickets are their primary food. These species occasionally eat fruits. These brown-capped pygmy woodpecker species probe into crevices in wood and under bark. They also glean prey from leaves and twigs. They also feed from ant nests and termite mounds. The breeding season of the brown-capped pygmy woodpecker species is from January to May in most of India. In Sri Lanka, the breeding season is mainly from February to July. When conditions are favorable a second brood is raised during October to December. These pygmy woodpeckers are monogamous and territorial. The nesting sites of these pygmy woodpecker species include trunk and branches of trees, away from the foliage. Both of the pair take part in excavating nesting cavities and incubating eggs. The brown-capped pygmy woodpecker clutch may contain two to five round white eggs. The chicks hatch out after 11-14 days of incubation. Both the parents feed and protect their altricial young. The nestlings fledge by the fourth week. These brown-capped pygmy woodpecker species are non-migratory, resident birds. The birds in higher altitudes move to lower levels and plains during winter. Post breeding, the juvenile brown-capped pygmy woodpeckers may disperse and establish in new locations within the range. They may make local movements for feeding and breeding within their range. The global population size of the brown-capped pygmy woodpecker (Picoides nanus) has not been quantified. The overall population trend of these species is considered to be increasing. Throughout its range, this pygmy woodpecker species is reported to be uncommon to locally common. The generation length is 5.2 years. Its distribution size is about 3,360,000 sq.km. Habitat alteration and destruction and deforestation are the main threats that may endanger the survival of these brown-capped pygmy woodpecker species. The brown-capped pygmy woodpecker (Picoides nanus) does not approach the thresholds for being Vulnerable either under the range size criterion, or under the population trend criterion or under the population size criterion. 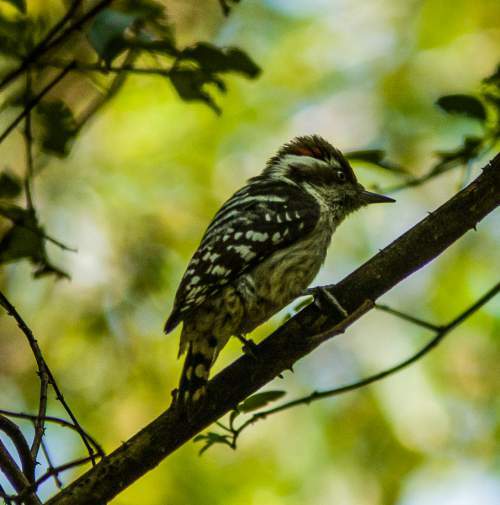 The IUCN (International Union for Conservation of Nature) has categorized and evaluated the pygmy woodpecker species and has listed it as of "Least Concern". The CITES (Convention on International Trade in Endangered Species of Wild Fauna and Flora) status is ‘Not Evaluated’ for brown-capped pygmy woodpecker (Picoides nanus). The brown-capped pygmy woodpecker (Picoides nanus) is closely related to Sunda pygmy woodpecker (Picoides moluccensis) and earlier it was treated as conspecific with P. moluccensis. The three recognized subspecies of the brown-capped pygmy woodpecker are: Picoides nanus nanus (Vigors, 1832), Picoides nanus cinereigula (Malherbe, 1849) and Picoides nanus gymnopthalmos (Blyth, 1849). Current topic in Birds of India: Brown-capped pygmy woodpecker - Picoides nanus.